The Baird’s Village Aquaponics project is one that I first heard about several years ago, and I was immediately intrigued by it. 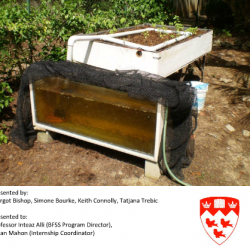 The project was the implementation of backyard scale aquaponic systems on the island of Barbados (in the Caribbean). As I remember the report, the goals were to produce food for local consumption and to use minimal energy and construction resources. Though it has been a while since I read the report, I do remember that the goals, design and implementation of the project were well thought out, and in my opinion, well executed. Unfortunately, in recent years, I not heard anything more about the project. Well, that is until this morning. In my stumbling through the internet, I came across a link to the paper below. It was written by Keith Connolly and Tatjana Trebic . Now, this is not recent news about the project, the paper was written in April 2010, but it is at least new information to me about the installation. I believe that this was written as a project for a course that the authors were taking at McGill University related to “Bioresource Engineering”. To enjoy this paper, please click on the linked image below. In the paper, there is some great information regarding component design, stocking and biology for Tilapia, and production records for various crops.